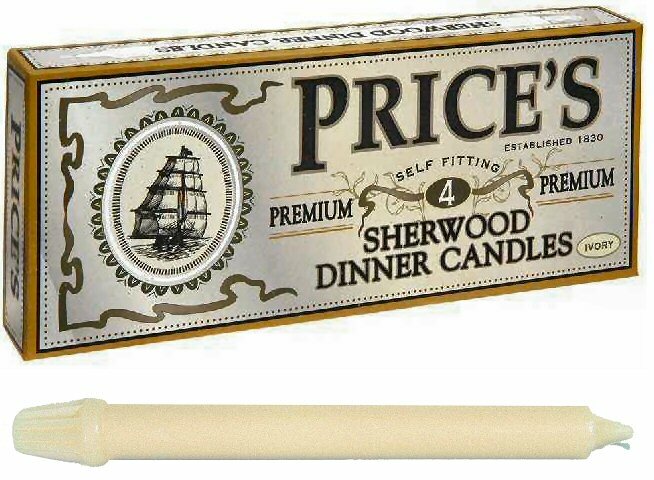 Price's Patent Candle Company began manufacturing candles in 1830. By the end of the century the company was the largest maker of candles in the world. It made stearine candles that burned as well as more expensive beeswax candles and held 114 patents for its inventions. Later the introduction of mass production enabled Price's to dominate the nightlight market. By 1859 Price's were producing 130 differently named and specific sizes of candle. Between 1910 and 1912 Price's took over two London manufacturers, Francis Tucker and Charles Farris, suppliers to the Catholic and Anglican churches. Both companies survive today as trademark names used by Price's for their beeswax church candles. 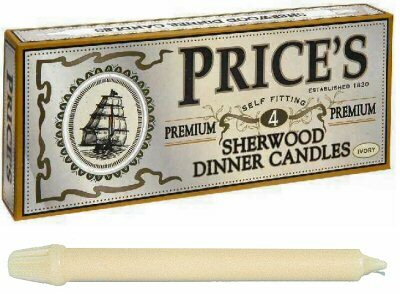 Price's Heritage range of dinner candles are classic high-quality candles made of Stearine and Beeswax, beautifully packaged in the the same box as their Victorian originals. We offer 3 beautiful sets of some of the finest candles available, suitable for gracing the the most lavish of banquets - an ideal gift. Price's have a long and close association with the Royal Family from the time when the launch of their new composite candle coincided with the wedding of Queen Victoria and Prince Albert. Today it holds 4 Royal Warrants. Two in its own name for The Queen and The Prince of Wales and, two in the name of Charles Farris, for The Queen and, until recently, The Queen Mother. This special royal status means it supplies candles for all Royal state occasions.